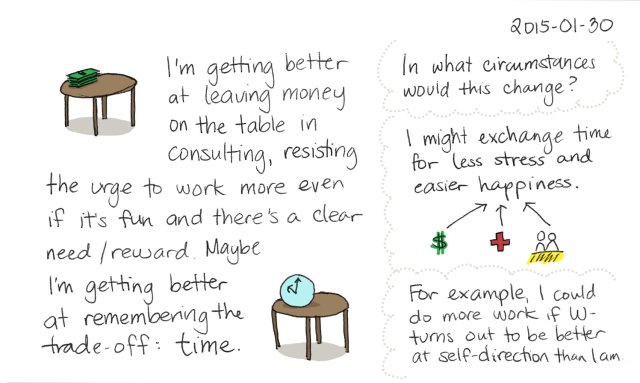 Any time I want to, I could spend more time consulting. This would make my clients happy. It would help me create much more value, and they would get more value from me than from other ways they could spend their budget. I would improve my skills along the way, especially with people’s requests and feedback. And to top it all off, I would earn more money that I could add to my savings, exchange for other people’s time or talents, or use to improve our quality of life. Maybe I can use this temptation’s strength against it. Maybe I can treat client work (with its attendant rewards and recognition) as a carrot that I can have if I make good progress on my personal projects. If I hit the ground running in the morning, then I can work on client stuff in the afternoon. A two-hour span is probably a good-sized chunk of time for programming or reporting. It’s not as efficient as a four-hour chunk, but it’ll force me to keep good notes, and I know I can get a fair bit done in that time anyway. 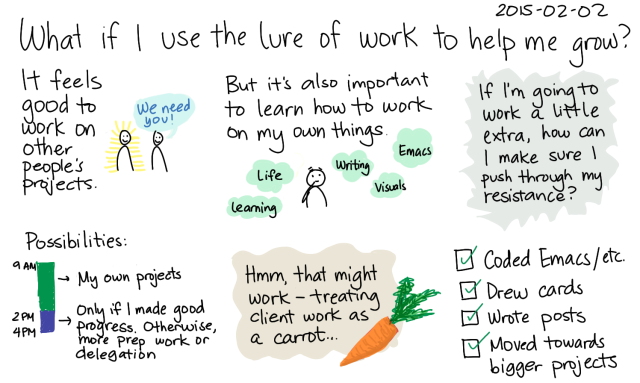 The other part of this is making sure that I don’t give myself too-low targets so that I can get to client work. It’ll be tempting to pick a small task, do it, and say, “There, I’m done. Moving on!” But I have to sit with uncertainty and figure things out. I expect that learning to work on my own things will mean encountering and dealing with inner Resistance. I expect that my anxious side will whisper its self-doubt. So I lash myself to the mast and sail past the Sirens, heading towards (if I’m lucky!) years of wandering. Part of this is the realization that even after my experiments with delegation, I’m still not good at converting money back into time, learning, ability, or enjoyment. Time is not really fungible, or at least I haven’t figured out how to convert it efficiently. I can convert time to money through work, but I find it difficult to convert money back to time (through delegation) or use it to accelerate learning. 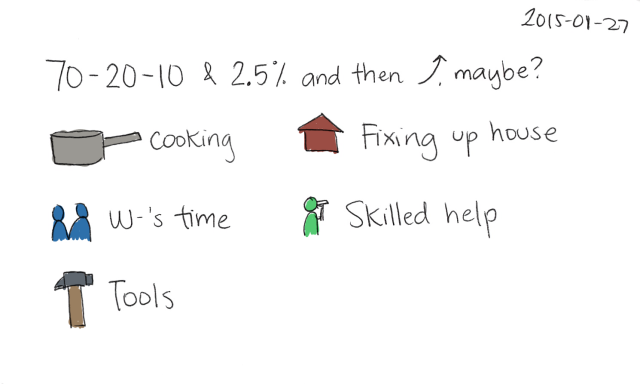 Extra money tends to go into projects, tools or cooking experiments. Gardening is one of my luxuries: a few bags of dirt, some seeds and starters, and an excuse to be outside regularly. Paying someone to do the first draft of a transcript gets around my impatience with listening to my own voice. Aside from these regular decisions, I tend to think carefully about what I spend on. Often a low-cost way of doing something also helps me learn a lot – sometimes much more than throwing money at the problem would. But there are things that money can buy, and it’s good for me to learn how to make better decisions about that. 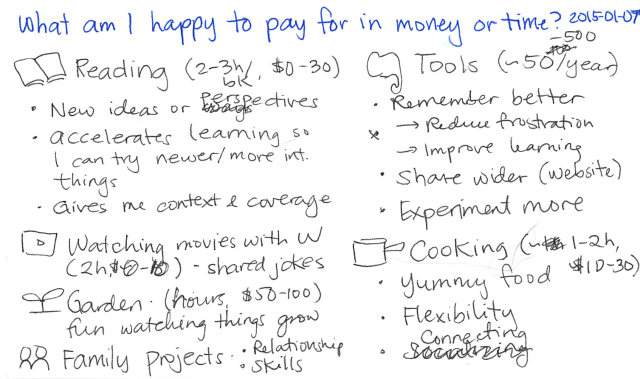 For example, a big savings goal might be “buying” more of W-‘s time, saving up in case he wants to experiment with a more self-directed life as well. House maintenance projects need tools, materials, and sometimes skilled help. Cooking benefits from experimentation, better ingredients, and maybe even instruction. How have I invested money into learning, and what have the results been like? Books? Some books have been very useful. On the other hand, the library has tons of books, so I have an infinite backlog of free resources. Buying and sketchnoting new books (or going to author events) is good for connecting with authors and readers about the book du jour, but on the other hand, I also get a lot of value from focusing on classics that I want to remember. Courses? Meh. Not really impressed by the online courses I’ve taken so far, but then again, I don’t think I’m approaching them with the right mindset either. Learn how to improve Emacs Lisp performance and reliability: profiling, code patterns, tests, etc. 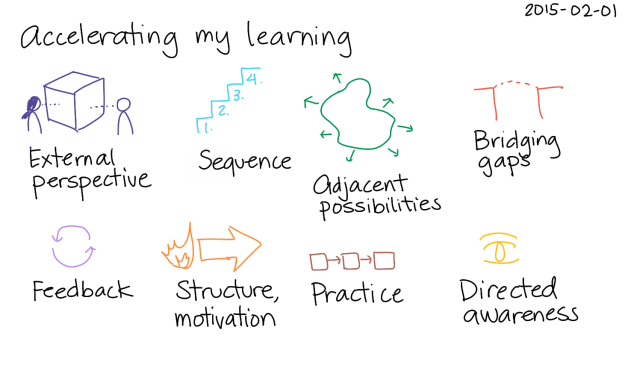 Actually, in general, how does one accelerate learning? Freedom: safety net that permits experimentation, time to focus on it instead of worrying about bills, etc. Hmm. I have some experience in investing in better tools, higher-quality resources, experimentation, feedback/analysis, delegation, and freedom. I’d like to get better at that and at investing in relationships and outsourcing. Come to think of it, that might be more useful than focusing on learning from coaching/instruction, at least for now. $: Bring the community together. Invest in platforms/organization. For example, I can use whatever I would have spent on airfare to create a decent virtual conference experience, or figure out the etiquette of having an assistant set up and manage Emacs Hangouts/Chats. Huh, that’s interesting. When I start thinking about investing in learning, I tend to fixate on finding a coach because I feel a big gap around directly asking people for help. But I can invest in other ways that might be easier or more effective to start with. Hmm… Thoughts?